The idea of “Midtown” (district? region? neighborhood?) beginning around 2001 pushed the area to the forefront of Detroit’s most recent efforts to revitalize and bring people and businesses back into the city. At the same time Midtown developments were at odds with an area that had become historically known for its crime, poverty, and drugs. Well into the 1970s and 1980s, the Cass Corridor was the most impoverished area of the entire state of Michigan. Likewise, Cass Corridor had one of the highest crime rates in all of Michigan. It is no surprise that what followed were a series of social services organizations and programs to assist the high populations of poor, homeless, and recovering addicts. In 2004, A Detroit Free Press article titled: “Development clashes with needs of homeless” highlighted the two different faces of the new Midtown area; the chain-link fence of a homeless shelter serving predominantly black men to the wrought-iron gates of a new condominium development where mostly affluent white people lived. The serious concerns that low-income people were being moved out of Midtown have arguably not improved over the last decade. In 2003, Salvation Army treatment facility and offices relocated and in 2004 Crossroads of Michigan had to relocate from its original building. 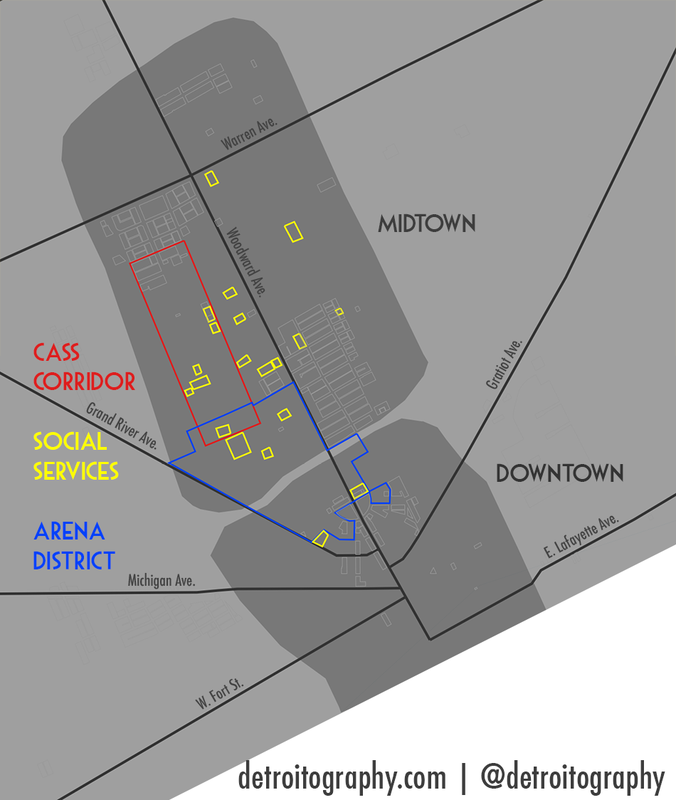 In 2005, NSO was supposedly in talks with the City of Detroit to relocate out of the Cass Corridor. The new Arena District, land owned and controlled by the Illitch family (Little Caesar’s, Fox Theatre, Red Wings, Tigers), will bring a new hockey arena as well as new development to connect many of the Illitch investment sites to create a strong entertainment zone for Detroit. I can’t imagine that the Illitch’s plan to have social services and homeless agencies as their neighbors. The concerns raised in 2004 have not been resolved and the increased level of development will only exacerbate the issue of resource disparities in Midtown, Detroit’s new city within a city. Ironically, the Cass Corridor’s emergence as Detroit’s “skid row” occurred as a result of the attempted “revitalization” of the original Skid Row along Michigan Avenue near Second Ave. The city demolished this area, including Detroit’s original Chinatown, in the urban renewal era after WWII. Its people and social services simply moved a short distance to the north. Is there a chance you could produce a version of this map with the social service organizations labeled? Wow great article. I am a 50 yo, single mom who has been living in a shelter for 9 months with my 8 year old son. I have applied for housing with several housing agencies. I have been denied even after appeals. I have never been a felon, but my crime is eviction. Many social service agencies are not supportive, staff disrectful. I have some stories to tell aboit favortism, nepotism, and jealousy. Let me know when you need a sustainability story.